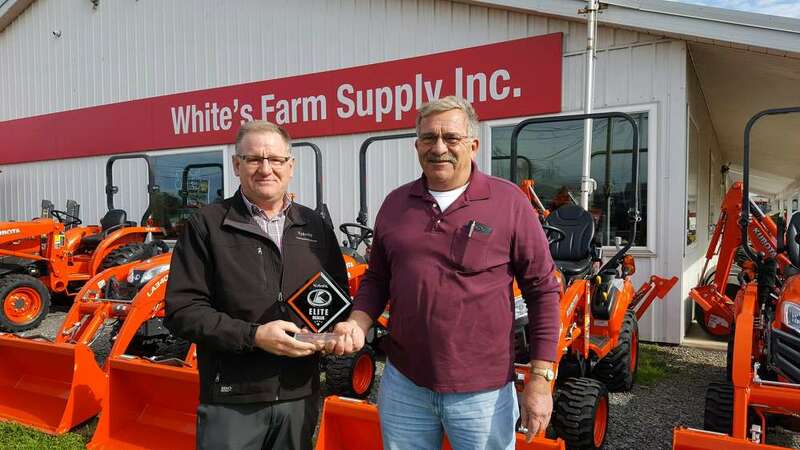 Kubota Tractor Corporation has honored White's Farm Supply Inc., located in Canastota, Lowville and Waterville, N.Y., with Kubota's Elite Award of Excellence, the company's most prestigious dealership certification and designation. The certification program was created by Kubota's senior leadership team in conjunction with its National Dealer Advisory Board to recognize dealers around the country that are providing customers with the “ultimate Kubota experience” from top quality equipment, to sales and financing, customer satisfaction and best in class service. “This is the fourth year of Kubota's Award of Excellence program and it is already setting a high standard that will pave the way for sustained growth and market segment leadership,” Ray Villarreal, Kubota director of dealer development said. “We have built a strong reputation for top quality on the manufacturing level and this award recognizes that White's Farm Supply Inc. is delivering on the Kubota promise before, during and after the sale. For more information, call 888/4-KUBOTA or visit www.kubotausa.com.